The foot and ankle form a complex joint involved in movement and providing stability and balance to the body. 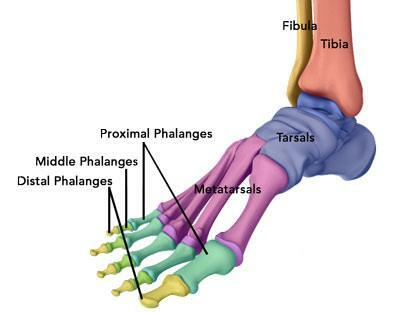 The foot and ankle consist of 26 bones, 33 joints, and many muscles, tendons and ligaments. The ankle joint connects the leg with the foot, and is composed of three bones: tibia, fibula and talus. The tibia or shinbone and fibula or calf bone are bones of the lower leg which articulate with the talus or ankle bone, enabling up and down movement of the foot. The foot acts as a single functional unit but can be divided into three parts: the hindfoot, midfoot and forefoot. Our feet and ankle bones are held in place and supported by various sof t tissues such as cartilage, ligaments, muscles, tendons and bursae . Ligaments are tough rope-like tissue that connect bones to other bones, and hold them in place, providing stability to the joints. The Plantar fascia is the largest ligament in the foot, originating from the heel bone to the forefoot. It extends along the bottom surface of the foot and is involved in maintaining the arch of the foot. The plantar fascia ligament stretches and contracts to provide balance and strength to the foot. Lateral ligaments on the outside of the foot and medial ligaments on the inside of the foot provide stability and allow up and down movement of the foot. Tendons are sof t tissues that connect muscles to bones. The largest and strongest tendon in the foot is the Achilles tendon, present at the back of the lower leg around the heel bone. Other tendons include peroneals and anterior and posterior tibialis.